Some 36 members of the Society departed for Broughton (near Banbury) in beautiful sunshine. 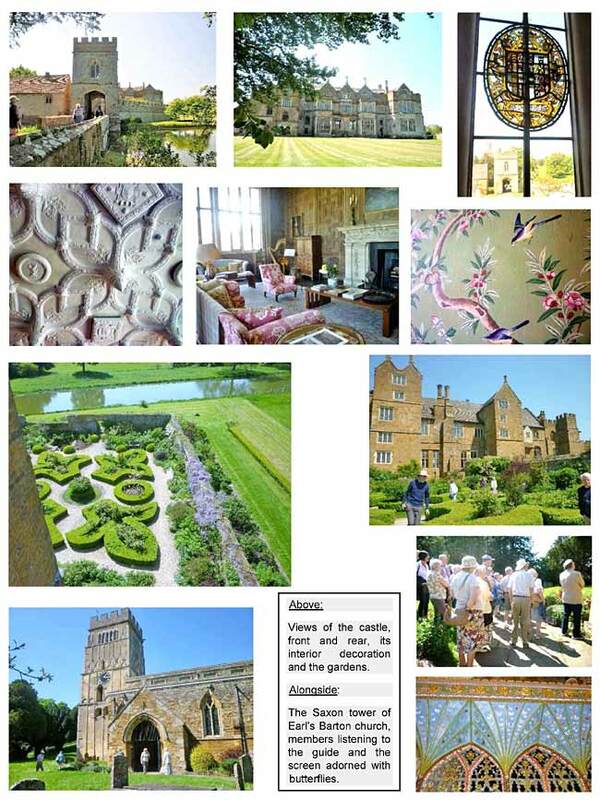 Set in the heart of Oxfordshire countryside, staff at Broughton Castle welcomed us with coffee. Although called a castle, it is a misnomer really, apart from its history and castellations. It dates from about 1300, was bought by William of Wykeham in 1377, and has been in the family of the Lords Saye and Sele ever since. Built in delightful honey-coloured stone it began life as a manor house and was transformed by Sir Richard Fiennes in 1554 into a stately Tudor mansion. Over the years, the family has ensured its continuation as their family home by keeping in line with political changes, especially during the Civil War. We were divided into two groups to tour what is not only a beautiful historical house but also a family home. From the Great Hall with its family portraits and Civil War armour decorating the walls, we moved through a mediaeval groined passage to the dining room, and then on to the chapel and Queen’s Bedroom, followed by the King’s Chamber and the Great Parlour. Delightful plastered ceilings adorn most of the rooms, with antique furnishings and large windows creating a feeling of magnificence. From the roof we saw the gardens and the estate to perfection in the sunshine. A long journey to Earl’s Barton church was rewarded by the sight of the enormous Saxon tower of All Saints’ Church. Inside the church Graham Halsall explained how the building developed over the centuries. The influence in its architecture is very much Roman, with obvious developments in the Early English and Perpendicular styles in the nave and chancel. The 15th century rood screen was handsomely painted in 1935. Norman blind arcades, a triple-lancet east window, a Tudor parish chest, a Saxon west door, and several mass dials on the outside walls can also be seen. On our homeward journey the driver took us to see the new bridge recently erected over the M1 to create a new bypass for the village of Kegworth. In many respects this was one of the Society’s more memorable excursions, but most enjoyable, nevertheless. First we had a severe gale warning from the Met. Office for Thursday morning. We began with a fairly lengthy coach trip to the Humber region, where we had coffee at a public house which had an electrician working in the coffee lounge when we arrived. 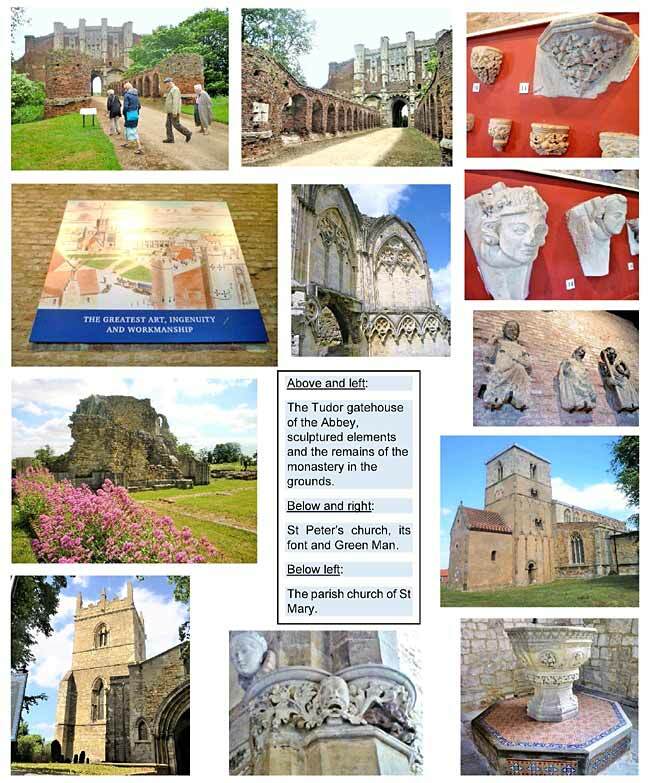 At the 14th century Thornton Abbey, an off-shoot of Bardney Abbey, the tour was mainly outside in a very strong wind which made it difficult to hear clearly what our guide, Glyn Copac, was saying to us. To get near to the ruins of the abbey church and cloister it was necessary to cross a field with a ‘docile’ bull (we were assured) in it. The Tudor Gatehouse structure was remarkable both inside and outside, and showed that the prior originally had more responsibility as a landowner (collecting rents and dispensing justice) than performing his religious duties. The coach then took us into Barton on Humber for our buffet lunch at the Old Mill public house. This was a most interesting and well-organised excursion, with plenty of time for relaxed consideration of what we were seeing. Our first destination was the Grade ll listed Marston Hall where we were greeted by the owners, Mr and Mrs John Thorold, whose family connection with the building goes back several centuries. After coffee and delicious biscuits we were divided into two groups, one to tour the house and the other to tour the garden and church. John and his wife have only recently come to live in the house and they are currently making a thorough restoration of the structure, some of which suffered at the hands of Oliver Cromwell during the Civil War. It was interesting to see their work so far, and to hear John’s enthusiastic hopes for the future. Even as it is, the house gives the feeling of a comfortable family home. The old church of Saint Mary within the site reveals how over the years the Thorold family have provided the Church of England with a number of clergymen, some of whom were raised to bishoprics or deaneries. 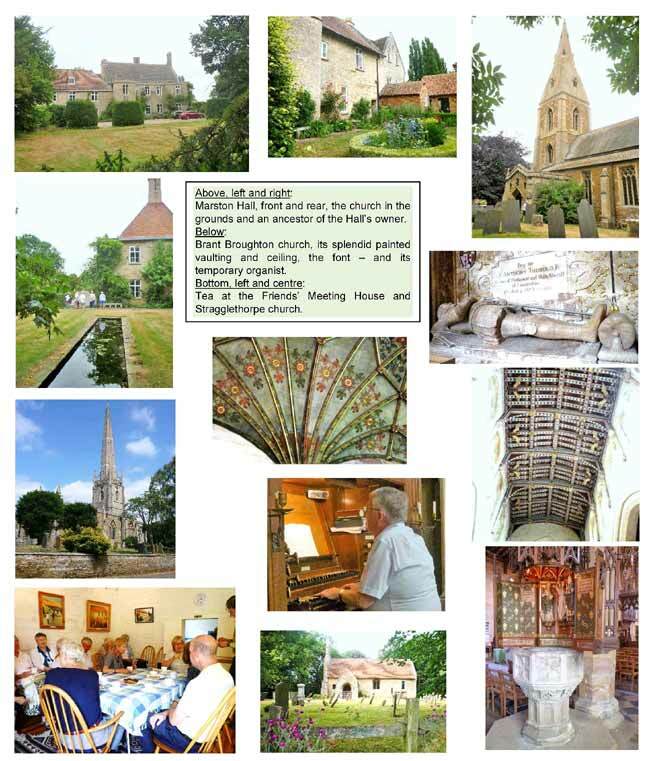 A most enjoyable and relaxed lunch was partaken at the Red Lion at Caythorpe before we journeyed to Saint Helen’s church at Brant Broughton, where we were warmly welcomed by one of the churchwardens. The interior of the building was beautifully restored by G.F. Bodley in the nineteenth century, in accordance with the need for ‘worship in the beauty of holiness’ at the time of the Oxford movement. After a short walk we visited the Quaker Meeting House and had another warm welcome with light refreshments. Wend y gave us a talk about the history of the Quaker movement and the establishment of this particular building in the village of Brant Broughton, together with an explanation of the pattern of worship there today. On our return journey we called at the tiny church of Saint Michael’s at Stragglethorpe, which has Saxon and Norman origins, and still has box pews and a two-decker pulpit. Altogether, a delightful day, complete with warm sunny weather. On the Society’s visit to the Friends’ Meeting House at Brant Broughton (see excursion report above) I was surprised and delighted to find a sundial which is unknown to the British Sundial Society. 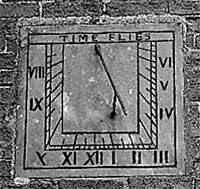 The dial is on a wall at the garden end of the Friends’ Meeting House, below the gable. It was installed in 1780, along with a mounting-block for horse riders and several internal improvements to the building, paid for from a legacy. Although it was a sunny afternoon at the time of our visit, there were too many trees to the south for the gnomon to cast a shadow. Presumably they had not been there when the dial was installed. The dial is not visible from the road and it is necessary to enter the garden at the rear of the Meeting House to see it. There is no maker’s name or initials on the dial, and the maker of the sundial is not known. The next job is to ascertain the name of the sundial maker, if possible.